We would like to thank you for your interest in volunteering with the Esplanade Association! Volunteering is essential to keeping the Esplanade clean and beautiful and enabling us to put on fun and free programs and events year round. Read our blog post to see the incredible impact volunteers made on the Esplanade in 2018. The Esplanade Association has opportunities for groups and individuals throughout the year. Working alongside Esplanade Association staff, volunteers participate in a host of projects, programs, and events including managing invasive species, painting benches, assisting with family-friendly events, helping with guided tours, and so much more! Volunteer opportunities vary by season. Bring your company’s employees to volunteer on the Esplanade as part of our award-winning Volunteer Program! 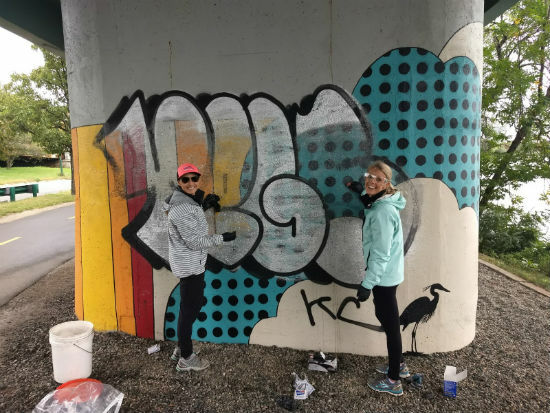 Volunteering with the Esplanade Association is a great way to build team camaraderie while participating in a visible philanthropic effort to benefit a local nonprofit. Volunteers report a sense of pride caring for a public space that they are likely to return to with friends and family. To learn more about the volunteer day, and to register to volunteer, click here. The Esplanade Association is seeking civic-minded community members to join our Individual Volunteer Program. Whether we’re hosting educational, cultural, or recreational programs for the community or caring for 13 ornamental gardens and 1,700 trees, we need your support! Volunteers will assist with event setup and registration, specialized horticultural tasks, office mailings, and more, based on their interests and availability throughout the year. Small groups or families are welcome to participate together! For more information about volunteer opportunities please visit our Individual Volunteer Program description or email our Volunteer & Programs Manager, Micah Jasny (mjasny@esplanade.org). The Friends Council is a group of emerging park lovers dedicated to quality of life in Boston and iconic open spaces like the Esplanade. Friends Council members are passionate about the Esplanade Association’s work to revitalize, enhance, maintain, and program the Esplanade and socialize at a variety of networking and benefit events throughout the year. Whether you’re a neighbor, run along the Charles each morning before work, take your favorite four-legged friend for their daily Esplanade walk, or relish the long summer evenings with your friends on the docks, the Friends Council is always looking for new members who treasure the Esplanade and want to share their enthusiasm with others. Learn more about our Friends Council. Are you inspired by the Esplanade? Are you looking to build your personal portfolio of photos? We need your skills! The Esplanade Association is seeking dedicated photographers to help showcase the beauty and vitality of the Esplanade and to help build awareness of the work we do to care for the park throughout the year. Learn more. We’re looking for a volunteer for a special long-term project. If you are passionate about trees, this might be the job for you! After a brief training, this individual would assess every tree tag in the park using a Google form; recording the ID tag and a few measurements. Your work will help us better understand the growth of park trees. If you would be interested in assisting with this project or learning more, please contact Micah Jasny at mjasny@esplanade.org.